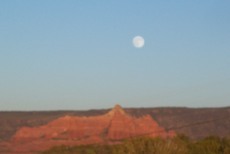 We drove from Houston to Sedona during the Saturday and Sunday before Thanksgiving 2007. On the way, when we were driving through Phoenix, we stopped at the Phoenix airport to pick up Elizabeth's mom, who had flown in from Ohio. 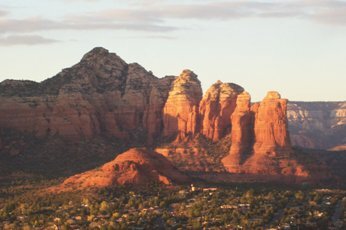 We loaded up mom and her luggage into our van and proceeded to drive the remaining couple hours to Sedona. 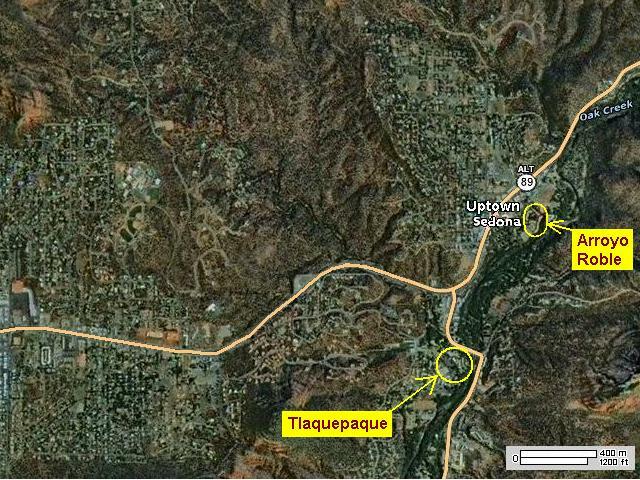 We stayed the week at a timeshare resort called Arroyo Roble, which is located in uptown Sedona behind the Sinagua Plaza shopping area. Oak Creek runs along the entire length of the back edge of the Arroyo Roble property line. Amenities at this resort include both indoor and outdoor swimming pools, indoor jacuzzi, exercise room, two outdoor tennis courts, an activities center with ping pong, and billiards, and a large grassy courtyard between the buildings. The courtyard has a large fountain in the middle and a porch swing and several gas-fired BBQ grills. 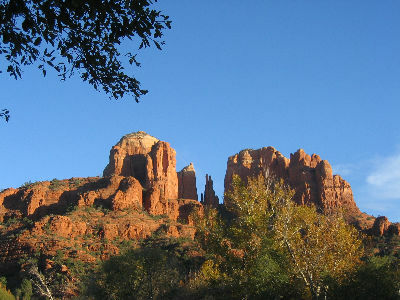 Because of it's locations and amenities, this resort is our favorite place to stay in Sedona. While in Sedona, Elizabeth and her mom had opportunity to do some serious souvenir shopping. Tom had opportunity to do some hiking with his dad, who was also staying in town that same week, but at a different timeshare resort. Jeremy and Katie Beth weren't too thrilled about shopping, but they did manage to catch some new movie releases at the local cinema. . . nextdoor to Art-Mart. During the week, Tom also caught a beautiful sunset and took lots of photos from the top of Airport Mesa. During our week in town, we ate at several restaurants including the Cowboy Club, the Hideaway, Red Planet Diner, the Airport Restaurant, Olde Sedona Bar & Grill, Oak Creek Brewery & Grill, and Joey's Bistro in Tlaquepaque, where we enjoyed their annual Thanksgiving Day "all you can eat" buffet. We reserved a table for 11 people at the Thanksgiving Day feast, which was a totally booked event. Reservation times at 1pm and 3pm were already sold out, so we took a remaining time slot at 11am. The food was plentiful and delicious. Tom pigged out on turkey, roast beef, ham, and shrimp before scavenging the dessert table. Late in the week Tom walked the annual Red Rock Fantasy lights tour at Tlaquepaque. This years tour was scaled back from previous years. There were only 29 exhibits this year compared to 43 last year. It was also quite cold and windy at the time we did the lights tour, which made most people wish they had taken the lights tour earlier in the week while the weather was warmer. We left Sedona on Saturday afternoon and dropped Elizabeth's mom off in Phoenix during our drive back to Texas. She caught her flight back to Ohio, while we continued on our drive. We also stopped in Tucson to have dinner at Pinnacle Peak Inn with Tom's brother, Greg and his family. We drove through the night and heard reports of snow and ice throughout west Texas. By the time we actually got to El Paso, we noticed about 4 inches of snow on the ground and a light snowfall in progress. From El Paso to Fort Stockton, there was only one lane open in each direction on Interstate 10. The closed lanes were crusted over with ice. The snow on the ground got thinner as we drove east and it finally disappeared around Ozona, TX. We continued driving and finally arrived home in late afternoon on Sunday. during Thanksgiving Week in 2007 are linked below. 4. Tom and his dad take a hike. 6. View from Airport Mesa. 7. Thanksgiving Buffet at Joey's Bistro. 9. The Drive Home to Texas.